The airport, located at Barangay Canaoay has been widened to accommodate international flights, particularly in the Asia-Pacific region such as China, Taiwan, Singapore, Malaysia, Thailand, Vietnam, Hongkong, Korea and Indonesia. Located at a promontory at the northern part of San Fernando overlooking the San Fernando Bay. Macho Temple houses a replica of the Virgin of Caysasay. Construction of the temple, which has a unique architecture specifically its dome and five gates was spearheaded by the Filipino-Chinese community in San Fernando. Stands northeast of the Capitol Hill, amidst verdant surroundings, overlooking the clear blue waters of the serene sea and the sprawling suburbs of San Fernando. Located at Brgy. Madayegdeg at the junction leading to Poro Point, San Fernando City. Built as a tribute to the soldiers who fought during the WWII. Popularly known as "monumento" and project of the Lions Club, demonstrating the resident's most precious contribution to all soldiers who defended San Fernando that causes its freedom. The 101 hectares of land including the golf course located at the end of Poro Point was acquired in 1903 for the United States Cavalry. It was the home of the 848th Aircraft Control and Warning Squadron, which provided logistics and administrative support to other radar detachments under its chain of command. Formally turned-over by the US government to the Republic of the Philippines on September 16, 1991. 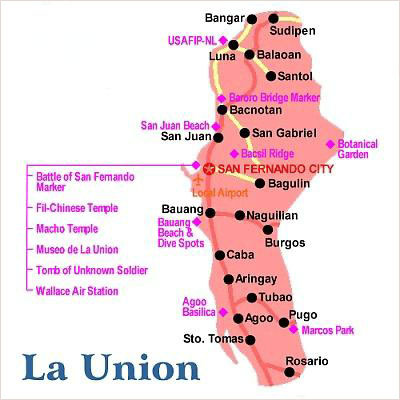 Located nine (9) kilometers northeast of San Fernando town proper through the San Fernando-Bagulin road, Bacsil Ridge was the last bastion of the retreating Japanese Imperial Army in the province of La Union. Later, the ridge constituted the east Flank of the 121st Infantry of the United States Armed Forces in the Philippines-Northern Luzon during the Liberation. Pindangan Ruins is the vestige of the oldest church that was built in May 6, 1786 that symbolizes the union of two sitios, SAN VICENTE DE BALANAC, a coastal village, and SAN GUILLERMO DE DALANGDANG, a village at the foothills of mountains, both desiring for mutual protection against their assailants, the pirates and the headhunters through Fr. Jose Torres in 1759. The settlement was named as Pindangan which was derived from the Ilocano word Pindang, a traditional method of drying fish in the locality. On the same date, May 6, 1786 that Pindangan was founded as Ministerio de San Fernando in Honor of King Ferdinand of Spain. The church was damaged due to the earthquake that occurred in the year 1892. The Carmelite Nuns built their Monastery in the area given to them by Bishop Victorino Ligot in 1974 and the ruins were uncovered for the people to see and appreciate. The ruins were preserved during the two hundred years that they were covered by vegetation.